I wore this last weekend when we went to visit a family farm with Claire. It was a chilly, wet weekend and so layers and boots were definitely called for. This weekend was the exact opposite! Weather was beautiful! We attended a family wedding. 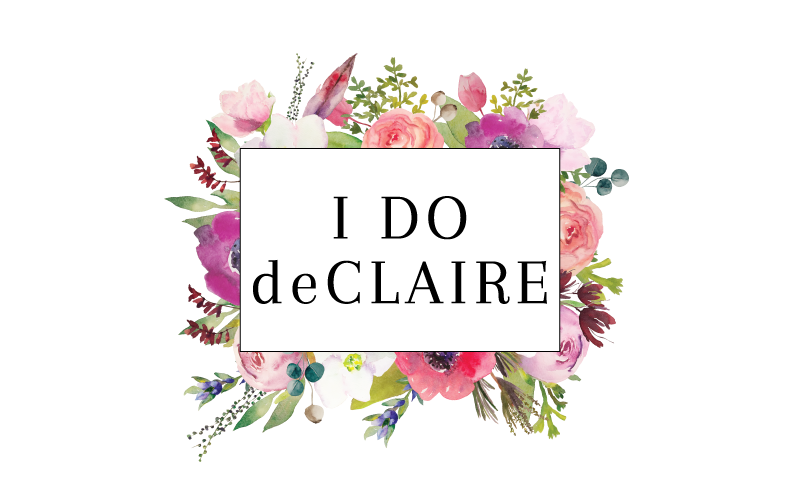 It was Claire's first and let's just say it's a good thing we have a while to practice before being a flower girl in her aunt's wedding this summer. Besides saying, "More Jesus" and pointing all around the church, she loudly proclaimed, "All done!" as the priest completed his first prayer. We spent the rest of the ceremony outside, so another good reason it was nice out! See how else I've worn my gingham here, here, and here. I love how you added a little sparkle with the necklace to this casual look. 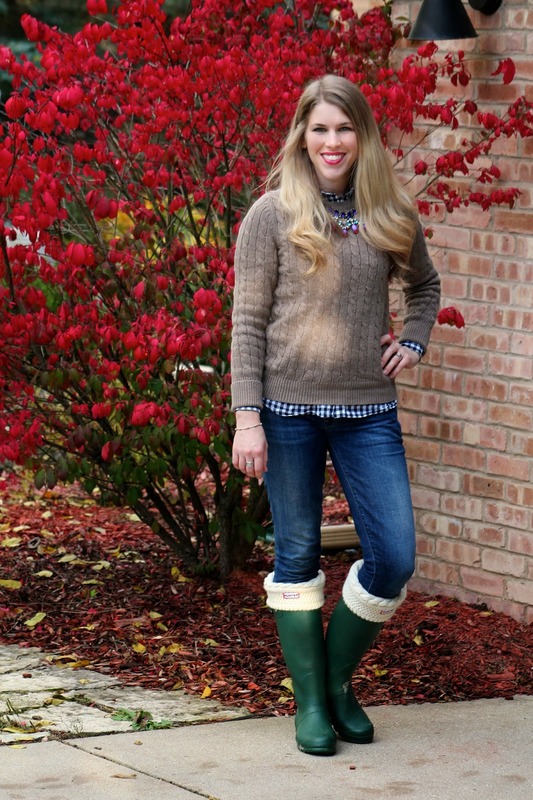 Great fall weekend look! Such a cute fall outfit! Your statement necklace is the perfect touch! I wouldn't say the boots themselves are warm, but the liners I have definitely are! more jesus! hehe love it. this outfit is so me--love it all. Love this cozy look, I cannot wait to wear outfits like this one. Love the sweater & shirt layering!! Such a super cozy & cute look. Have a great day Laura. Love your fall layers. That's the best part about fall. The tree behind you is gorgeous! Sounds like Claire is adorable!! Aww so pretty! 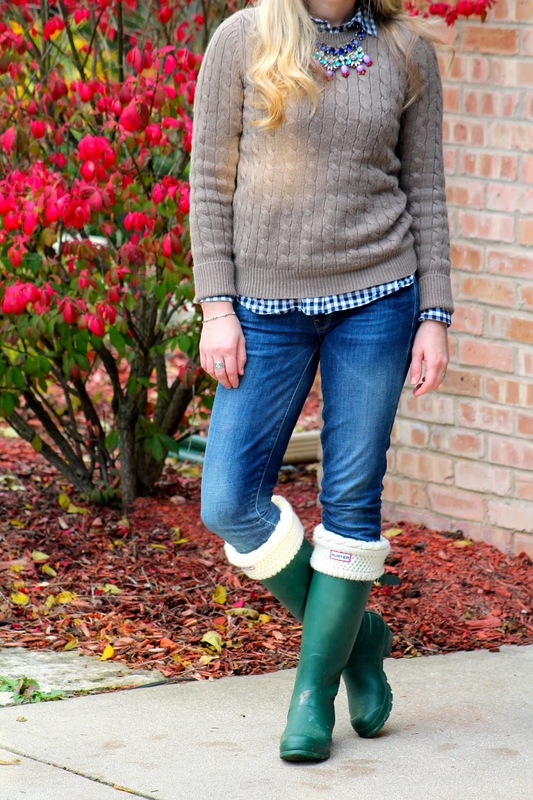 And this look is so perfect for a wet weekend--the hunters really do keep feet so dry!! 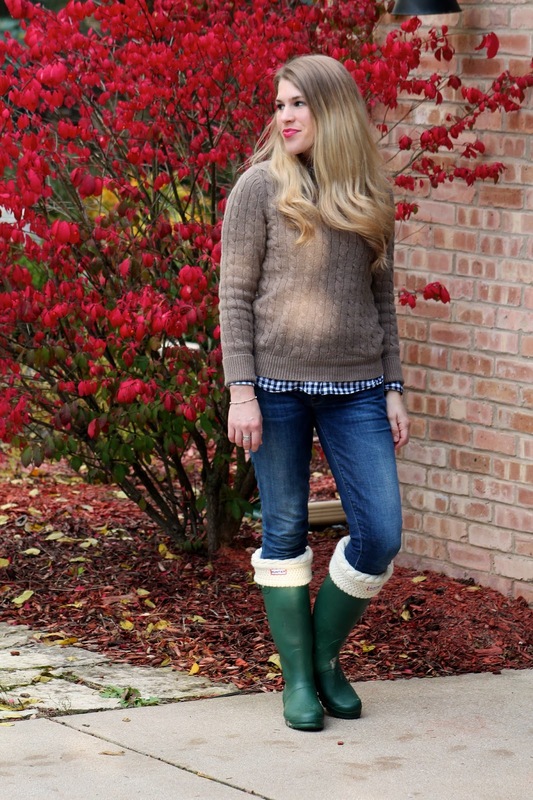 I adore Hunter boots! I love being able to get a little dirty without having to worry about ruining my shoes. I actually had a friend of mine the other day ask me if rain boots were in style or something now, I was like girl, you just don't understand! You need Hunter boots! Hope your week is off to a great start! Claire is hilarious. Leave it up ti kids to say things at the worst times. But its so cute. Gingham shirts are so versatile and your styles your beautifully. Beautiful fall colors! Love the boots!! Kids are so cute with the things they do. I love the plaid shirt hidden underneath your sweater and am looking forward to see u style it more often and in various creative ways. Love how we can see your gingham peeping through! Your statement necklace is stunning. I love how you've teamed something so glitzy with wellies! Love the look Laura! Love the layering and super cute boots! Perfect for a chilly/wet weekend. Awww, sounds like Claire had a great time! You look so cute and ready for fall in these layers and boots! You look amazing! This is a great layered look for the fall. 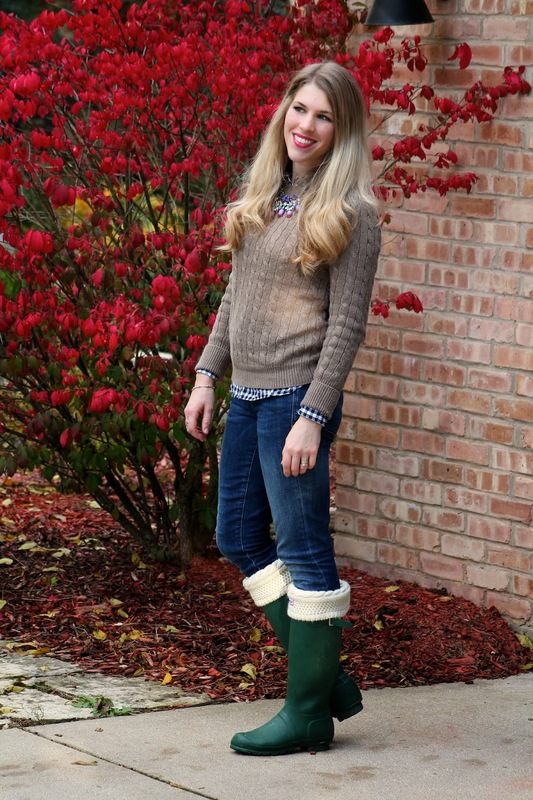 I love the hunter boots! Glad y'all had great weather this weekend...we did as well, and it was so nice!! Such a cute outfit. This looks like such a comfy and cozy look! I am asking for some Hunters for my birthday, and I think I'm leaning toward the green ones. Do you find them versatile? I do! I went with green because I figured they would pretty much go with anything! This is such a cozy look - those boots liners are so adorable!! P.S. 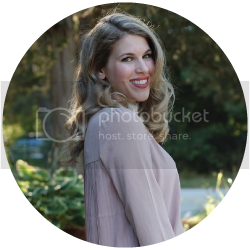 Hope you stop by Thursday to join TBT Fashion link up. Oh! I love those boot socks? Where did you get them, you probably already told me! You're just too darn cute! All.the.time! Matt just got them online and unfortunately can't remember the exact store. I think he searched through shopstyle, but I am pretty sure Neiman Marcus and Macy's has them. Sorry! I love that statement necklace with the gingham and sweater. Such a perfect, cozy fall outfit! I can't wait to wear my Hunter socks with the boots- they make the boots so much more versatile- not just for springtime/rain or mud & slush...but pretty darn warm for winter too! What a perfect outfit for fall! It makes me sweat just thinking about so many layers, but I know winter is just around the corner!